App Design | Fission Media | Edmonton | Immediate knowledge empowers now! Custom Makers of Great Apps! How do you create an app that is going to be widely used? That’s the key question that we focus on at Fission Media. The app must address a ‘need’ –whether it’s to entertain, educate, facilitate or sell. Every media project starts with an idea. We help you realize that idea via the key steps to developing mobile apps: Defining the need, the market, the competition, the potential for sales…and then defining the structure, the user interface (UI), the server connectivity (APIs) if required, the user experience (UX), design mock-ups, cost estimate and timeline for completion. You are involved every step of the way, from the production plan through the stages of prototype, Alpha and then Beta testing, and finally the launch into the iTunes or Google Play Stores. At Fission Media we use top local professionals on all our projects. In this way, you get the talent and experience required along with quick and precise interactions. 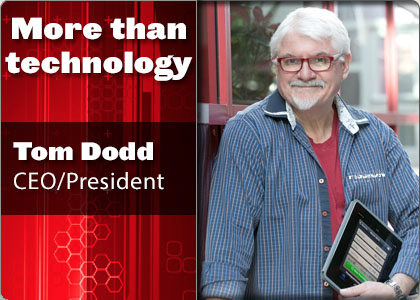 Tom Dodd is a founder and president of Fission Media. He is the creative lead and producer on all of our projects. Tom has over 20 mobile apps and 400+ TV programs to his credit plus a dozen or more documentaries for such companies as the BBC, NFB, Access TV, CBC and ITV (UK), – many of them award winners. Prior to forming Fission, Tom was half owner and Executive Producer for Critical Fusion, a multimedia company. Though he is still very active in video production, his main focus is now on mobile. His experience in business and both the digital and film industries serve as the foundation for the development of well managed, diverse new and exciting mobile applications. Copyright © 2007-2018 Fission Media All rights reserved.